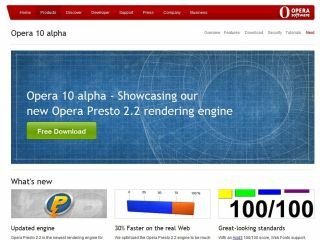 An alpha version of the Opera 10 browser has arrived for public download – with the Opera Presto 2.2 rendering engine the highest profile arrival. Opera is fighting for its corner of the browser market with Internet Explorer's dominance finally beginning to fade and newcomer Google struggling for purchase. Opera 10 should benefit from the new Presto 2.2 rendering engine by offering a 30 per cent increase in speed from Opera 9.5. The new browser will also offer fine-tuned standards support, spell checker, auto-updates and support for HTML formatting in emails. "My favourite development in this release is the support for new web technologies, which allows people to explore new ways of using the Internet," says Johan Borg, Vice President of Consumer Engineering, Opera Software. "Our 100/100 Acid3 Test score is only a first indication of the impact these new web technologies will have. We look forward to your feedback on Opera 10."